The optimum time for frost seeding legumes and grasses into established pastures varies with region, and we’ve reached the point where that time line has started its migration north. Regardless of where you hang your hat, the basic recipe for successful legume/grass establishment is pretty much the same. Here are some key considerations when frost seeding pastures. Seed-to-soil contact is critical for success. Ideally, pastures or paddocks need to be closely grazed the previous fall or prior to seeding. This also slows spring regrowth and lowers the amount of plant competition for new developing seedlings. Begin seeding when there is a freeze-thaw gradient between night and day. Along with precipitation, this enhances seed-to-soil contact. Have realistic expectations. Not all forage species yield the same success, especially if the seed is broadcasted. Clovers, especially red clover, generally result in the greatest establishment success. Birdsfoot trefoil is also a possibility. Perennial or annual ryegrasses are the easy winners among grass options. Large, fluffy grass seeds are more difficult to frost seed, though some success has been experienced with orchardgrass. Grass seed won’t “throw” as far as legume seed. It’s difficult to seed them together without getting alternating strips. Seed at a half rate in both directions of the pasture to get the most uniform establishment. For large-seeded grasses, drilling the seed into the soil may offer a higher likelihood for success. This can't be done when soil conditions are wet. Once temperatures begin to warm and plant growth is initiated, flash graze frost-seeded pastures in the spring to minimize plant competition until new seedlings become established. 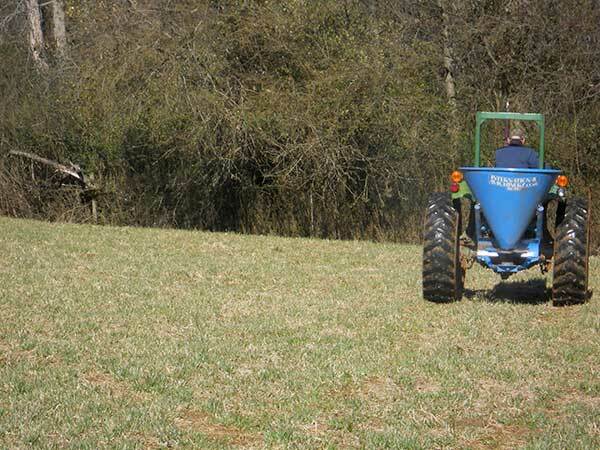 Frost seeding is a cost-saving and effective means of introducing or maintaining grass and legume species into pastures. Success will vary from year to year based on environmental conditions. Maximizing seed-to-soil is the primary key for success.